So good with burgers on the grill. Dovetailing Tip: Use 2 tablespoons of the bacon drippings that you saved from this Meal's burgers. The bacon dripping make a world of difference in taste. 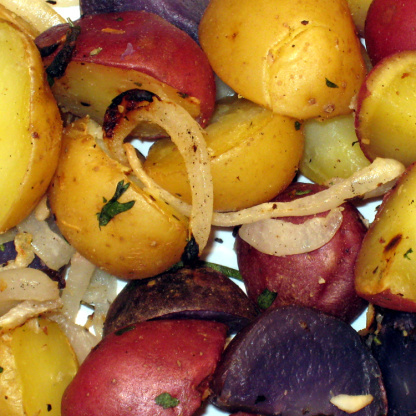 Combine potatoes, onions and herbs in a large bowl. Combine oil, butter, garlic, salt and pepper in a small bowl. Arrange potato mixture on 1/2 of a piece of foil large enough to accommodate all the ingredients when made into a packet for grilling. Grill over medium hot coals for 30 to 45 minutes or until potatoes are tender, turning and shaking occasionally.